I think I’m going to start quoting lines of text from Preston Sturges scripts. We can enjoy the dialogue by watching the films, but only by owning the pricey published scripts can we get the added benefit of the scene descriptions. In other words, fresh Sturges sentences! 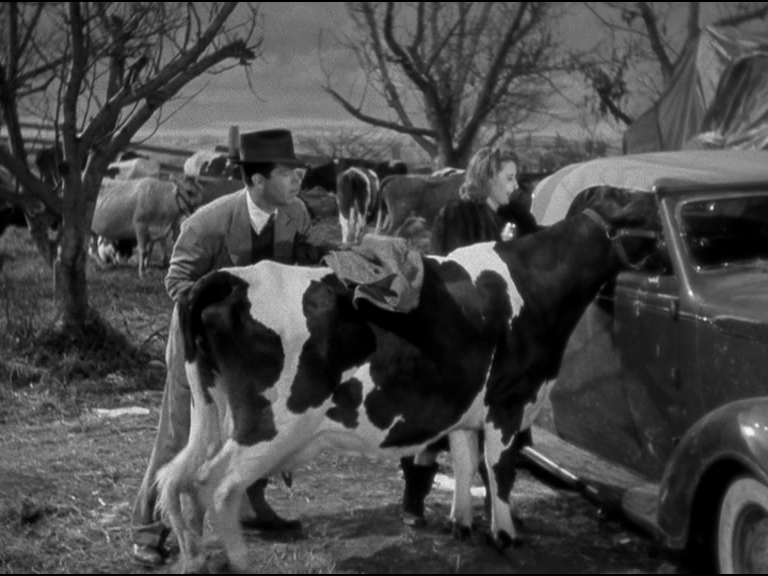 In REMEMBER THE NIGHT, subject of an early edition of The Forgotten, Fred MacMurray parks his car in a field and he and Barbara Stanwyck awaken to find themselves surrounded by cows, with one bold specimen actually thrusting its enormous head into the vehicle to munch on la Stanwyck’s Edith Head hat. The couple decide they might as well milk the cow for breakfast, with Stanwyck assigned to distract the ruminant with loving caresses while Fred does the business with the udder. Stanwyck coos to the cow, whom she christens “Bossie”, asking if she likes her ears tickled. From the inside of the car we hear a cavernous moo.